After a summer of lazy, hazy, rosé-filled days, it's time to kick off an AWESOME autumn! For the autumn only, enjoy our award-winning BB training at an earlier time, and SAVE with a special code. Get fit. Love your body. come meet your mat leave squad this fall at BB! "I have to pick up my preschooler at noon." "My baby naps in the late morning." "An 11:00 class interferes with my morning TV talk show line up." Whatever the reason, you want to train a little earlier. So we're going to open up 2 amazing locations for 9:30 a.m. BB classes with baby, but only for 6 weeks. Join us for a special 6-Week Awesome Autumn enrolment! Claim my 9:30 spot & special pricing! Here's your chance to join BB for just 6 weeks or try an exclusive, earlier class time! Think of it like a mega-trial. You'll be feeling fab & #BBstrong at the end of 6 weeks! 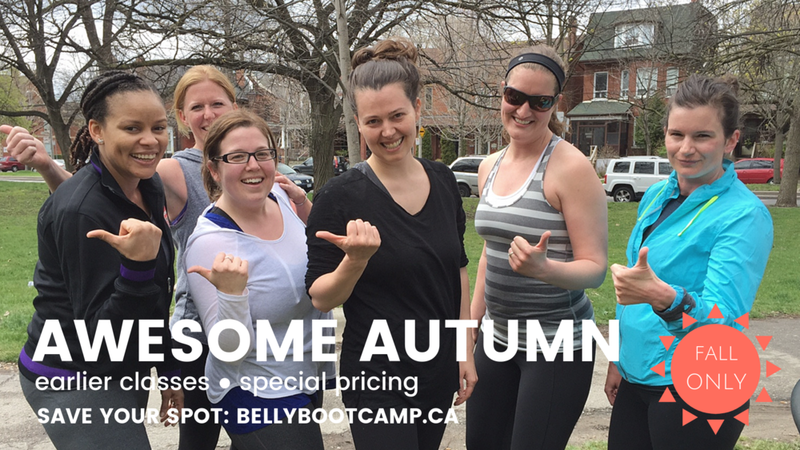 Let's make your autumn training awesome by adding an extra class to your schedule before our outdoor season ends! Don't miss this special offer & special pricing! Classes begin week of September 17, 2018. Hit the registration links below & select "Awesome Autumn" to save your spot. May not be combined with any other offer. Awesome Autumn pricing only available on 9:30 classes as outlined above. May not be applied to regular BB classes. No holds. Fees subject to HST. Registration subject to availability.